Welcome to Radiance Dance Studio! Please complete the following registration form. 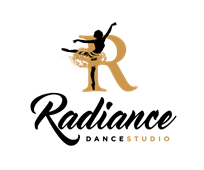 Radiance Dance Studio is committed to providing the highest quality dance instruction in a safe, positive, and inspiring environment. Individual confidence and self-esteem, respect and appreciate of others, and building a sense of community -- all while having fun -- are the goals. A Handbook containing the rules and policies in place to help achieve these goals will be issued and it is everyone's responsibility to work together to Dance Radiantly.